The story of Robin Hood has been told and retold many times on the big and small screen. For my money, I'll take Disney's animated film over any big, gritty, blockbuster effort any day. The story is always tweaked to fit comfortably with the sentiments of the era, although the core story, a noble thief who robs from the rich and gives to the poor, always remains. The latest take on Robin Hood, from Peaky Blinders director Otto Bathurst, is both beholden to all of those familiar attempts and yet contemptuous of them. It attempts, badly, to distinguish itself by stealing from other generic action flicks to "modernize" the character, and yet doesn't even fully commit to this idea. The result is a confusing, bland adventure that misses the mark in introducing the infamous vigilante to a new audience. 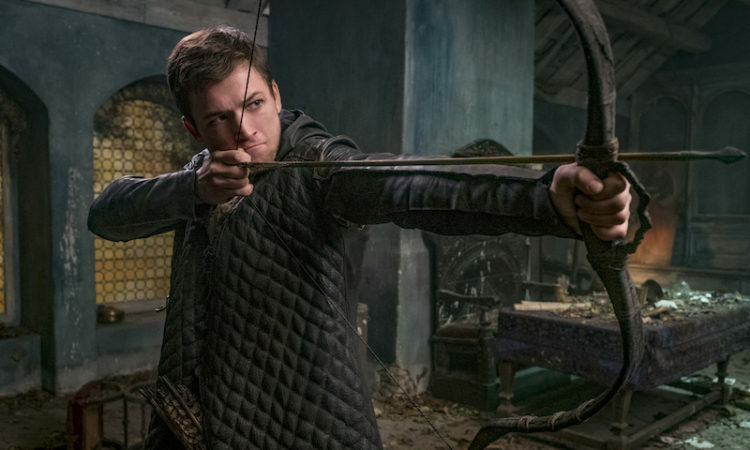 Clearly a devotee of fellow Brit Guy Ritchie, Bathurst's Robin Hood uses violence and "cool" camera tricks to hide a distinct lack of personality. Even the time period it's set in is nebulous, with voice-over brushing aside any need to place when exactly Robin's story takes place. The reason is that it gives Bathurst freedom to do basically whatever he wants. 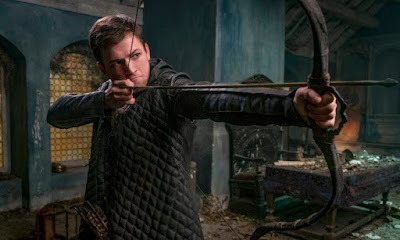 If he wants to send regal Lord Robin of Loxley (Taron Egerton) to fight in the Crusades, only to have the warzone look like something out of the Iraq War, then so be it. Even their armor looks like military fatigues, and the Muslim combatants they face are armed with Gatling guns that fire arrows. It's the lazy sort of thinking that assumes bigger is automatically better, rather than putting in an effort to just tell a decent story. Overmatched by the demands of a much larger budget, Bathurst fills the screen with ugly CGI that makes it hard to tell what's going on, yet when the action slows down it's so dull you won't really care. But at least Robin's altruistic motivations remain intact, right? Well....not so much. This Robin Hood is motivated by baser instincts than concern for his fellow man. While he did manage to impress the fierce Islamic warrior Yahya (Jamie Foxx), Robin returns to Nottingham with little on his mind other than revenge against the cruel Sheriff (Ben Mendelsohn) who drafted him to fight in the Crusades. Robin is also motivated by spite against Marian (Eve Hewson), his former lover who, believing he was dead, began shacking up with the politically-ambitious Will Scarlet (Jamie Dornan). It's unclear why we're supposed to root for this Robin Hood other than his wide smile, and that he's not an outright monster as the Sheriff frequently proves to be. His motivations are an absolute mess, with screenwriters David James Kelly and Ben Chandler seeming to forget why Robin Hood is there doing anything at all. For vast swaths of the film our attention shifts to the Sheriff, with Mendelsohn providing the weakest villain performance of his career. This from an actor who has made humanizing villains his calling card, but he can do little with the raging Sheriff of Nottingham, whose high (Low?) point is reminiscing about the painful abuse he suffered at the hands of the clergy. When he starts talking about the broomsticks they used it's pretty squirm-inducing, but otherwise, the Sheriff is hardly terrifying and never seems like much of a threat. Worse, this Robin Hood is an arrow that never leaves the quiver. A passenger in his own tale, Robin is convinced to rebel against the Sheriff solely at Yahya's urging, and from there the relationship is closer to mentor/pupil than brothers-in-arms, and if that's what you're looking for you're better off seeing Creed II. It doesn't help that Egerton is basically playing the exact same smug character he was in Kingsman, only Robin's evolution from unconcerned noble to war hero to man of the people utterly unconvincing. Even the love triangle between him, Marian, and Will leaves much to be desired, mainly because nobody really seems all that interested. Marian is consistently playing second fiddle to her suitors' personal grievances, and she doesn't have much of an impact in her few moments in the spotlight. The same goes for Foxx who, let's all remember, actually won Best Actor once in his career. It's legit disappointing to see him relegated to yet another secondary role in a lousy movie. He deserves better. Robin Hood is of the same ilk as other stylish but empty rebrandings of famous legends, such as King Arthur: Legend of the Sword (by Ritchie, no less), and The Legend of Tarzan. Whatever hope there was of building a franchise around the archer have probably been dashed, and the next time we see Robin on the big screen it's likely with someone else under the hood.